Ah! It has been quite a journey conceptualizing and executing ChangeBhai in a very short span of time. The facts that came out of the groundwork done by us have been eye-opening, to say the least. The idea has been lurking around in our minds since ages and we are glad we are at the final step of launching it amid much fanfare and excitement. We would like to thank Rajiv Makhni and his entire team at NDTV for encouraging us at every step. A special mention for Rajiv Sodhi (MD of GoDaddy) for being such a great mentor to the ChangeBhai Team throughout this unforgettable journey. The support and valuable advice given by Saurabh Srivastava (Co-Founder- Indian Angel Network, Past Chairman-NASSCOM & Indian Venture Capital Association, Chairman Emeritus – TiE, New Delhi &NCR ) and Sanjeev Bhikhchandani (Founder of Naukri.com, Jeevansaathi.com, 99 acres.com) was much more than what we could have ever asked for! 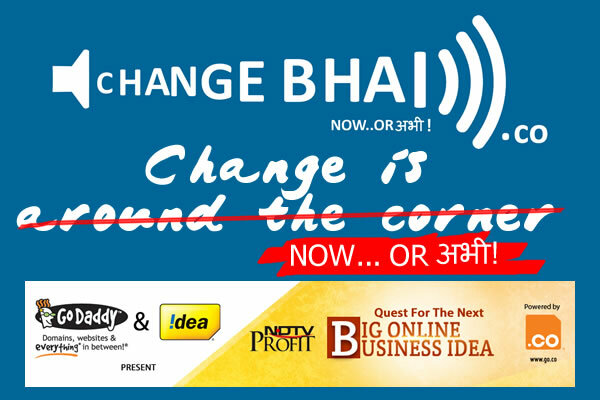 So, do catch ChangeBhai in the Grand Finale of NDTV ‘s Quest for the Next Big Online Idea on NDTV Profit at 8 pm on Saturday (10-08-2013) and 4 pm on Sunday (11-08-2013)! We seek your support to bring about this much required change. Keep sending your inputs to help us refine our approach!